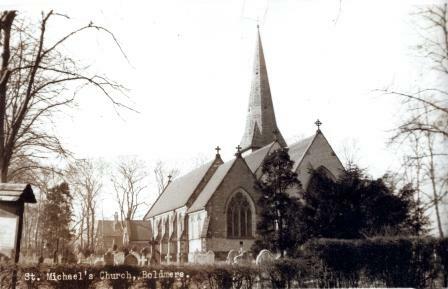 In 1848 a school for girls and infants was built in Boldmere and on Sundays a morning service was held there. This led quite naturally to the building of a church in 1857. It was originally a small country church set in a pleasant but sparsely populated rural area. Since those early days, the nature and population of the parish has changed out of all recognition. The mid-19th century railway began that process and now almost every one of those original fields has been built on. The resulting population numbers over 15,000. Following a fire in 1964, which destroyed practically all the church, a new building was constructed embracing both the old Early Decorated Style and the more modern styles of the mid-1960s. The South Aisle and the Tower survived the fire and the architect used his skill to blend the old with the new, at the same time making some changes and improvements. The consecration of the new St Michael's took place on 28th September 1967.